From left, Shane Darcy, myself, Kjell Anderson and Alex Hinton. From left, Vinodh Jaichand, Roger Hood, Aimé Karimunda and myself. Muyuboke Aimé Karimunda, whose thesis is on the death penalty in Africa. 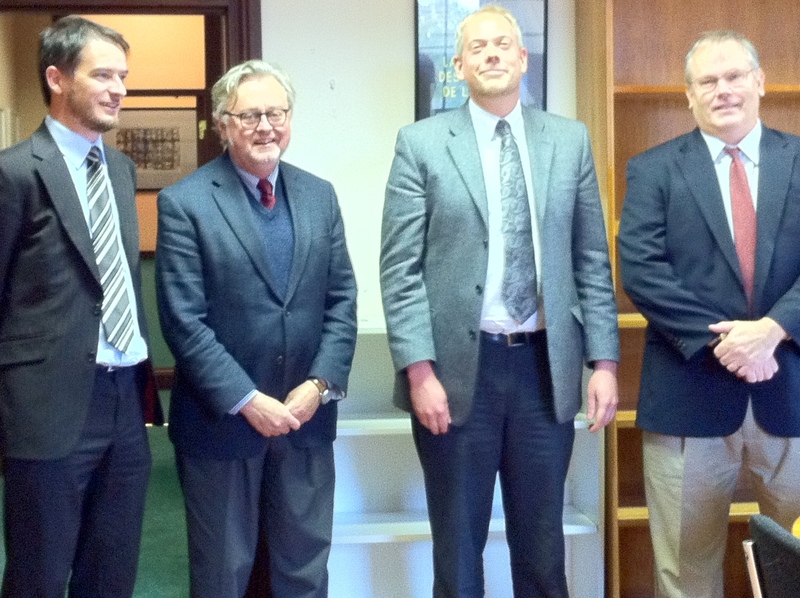 The external examiner was Professor Roger Hood of All Souls College, Oxford. Dr Vinodh Jaichand was the internal examiner. Aimé is a university lecturer in Kigali. Kjell Anderson, hose thesis is entitled ‘The Dehumanisation Dynamic: A Criminology of Genocide’. 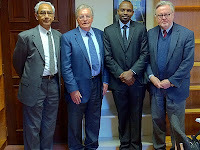 The external examiner was Professor Alex Hinton, of Rutgers University, and current President of the International Association of Genocide Scholars. The internal examiner was Dr Shane Darcy. Basil: How do you do doctor. Very nice to have you with us, doctor. Dr (Mr) Abbott: Thank You. Basil: And Mrs Abbott, how do you do. Dr (Mr) Abbott: Dr Abbott, actually. Dr (Mr) Abbott: Doctor Abbott. Dr (Mrs) Abbott: Two doctors. Basil: (to Mr Abbott) You’re two doctors? Basil: Well, how did you become two doctors? That’s most unusual…I mean, did you take the exams twice, or…? Dr (Mrs) Abbott: …I’m a doctor. Basil: You’re a doctor too! So you’re three doctors. Dr (Mr) Abbott: No, I’m a doctor. My wife’s another doctor. The Justice Cascade is a new book by Kathryn Sikkink of the University of Minnesota that is full of important insights into the role and effectiveness of international criminal justice. I was lucky enough to get an advance copy from her when I visited Minneapolis earlier in the year. It is based on a great deal of empirical research. Conclusions about the political impact of prosecutions are drawn. There is a fine review of it by Professor David Scheffer in the latest issue of the New Republic. We're all waiting for David's new book, All the Missing Souls: A Personal History of the War Crimes Tribunals, which is due out in December. It charts the role of international justice in United States policy during the 1990s, when David was the first Ambassador at large for war crimes issues. Last night, we went to see ‘The Passenger’, which is an opera about the great themes of international justice. It is largely set in Auschwitz. One of the protagonists, Liese, was an Auschwitz guard. She has kept her past concealed form her husband, who is a German diplomat. On their way to his posting in Brazil in 1958, she spots another passenger on the ship, Marta, and recognizes her as a former inmate of Auschwitz. In the first act, several of the women prisoners, from France, Greece and the Czech Republic, some of them Jews, tell of their past and how they ended up in Auschwitz. The message is unforgiving, as the two women, Marta and Liese stand alone on stage in the final scene. The blog was quiet last week, as I was in China (I can't access the blog in China) lecturing on capital punishment to judges in Guangzhou and Kunming. The general mood was very favourable to the restriction of capital punishment. But meanwhile, elsewhere in the world, there were some very unhappy developments. Troy Davis was executed in Georgia, some two decades after being sentenced to death. This was despite strong evidence that he is not guilty. There were appeals from around the world, but the authorities in the United States ignored them. Generally, though, the rate of execution in the United States is on the decline. It is about half what it was a decade ago. Some states have removed the death penalty from their legislation, and juries show increasing hesitation in imposing capital punishment ro recommending its use. Iran is one of the few countries where the rate of execution seems to be increasing. It is also right at the top of the list in terms of the rate of execution. Although China executes more people in absolute numbers, it is also much more populous than Iran. Per capita, Iran kills a lot more people than China. Last week, Iran executed a 17-year-old, Alireza Mollasoltani. He was hanged from a crane in public where the crime for which he was convicted had been committed in the city of Karaj, which is slightly west of the capital, Tehran. Mollasoltani said he had acted in self defence. Alireza Mollasoltani was born on 24 December 1993 which means he was not yet eighteen years of age at the time of the execution. A representative of the Iranian judiciary who was present at the hanging, Ali Rezwanmanesh, was reported to have said ‘Alireza was not a minor, according to Sharia, since in the Sharia the lunar calendar is used and the years are shorter’. Apparently, the Islamic lunar calendar is some 11 days shorter than the solar calendar, with 354 days a year. It is now beyond question that the execution of a person for a crime committed when under the age of eighteen is contrary to customary international law. With respect to Iran, it is also contrary to treaty obligations under the International Covenant on Civil and Political Rights and the Convention on the Rights of the Child. With his bizarre comment about the Sharia calendar, the Iranian judge seemed to understand that there was a legal problem with executing someone under the age of eighteen. Rather than deny that Iran was required to observe the international norm, he attempted a contrived argument about how years are to be counted. The international norms are in international treaties. At the international level, a year has 365 days. The first ratification of the amendment to article 8 of the Rome Statute adopted at the Kampala Review Conference, adding jurisdiction over certain offences committed in non-international armed conflict, has been submitted to the depositary of the treaty, the United Nations Secretary-General by San Marino. I had initially posted the news that San Marino had ratified the amendments concerning the crime of aggression, but Prof. Bruce Broomhall has corrected me. I understand that Germany hopes to be the first to ratify the aggression amendments. Also, the Maldives has become the 118th State Party to the Rome Statute. The Centre for Constitutional Rights has made public an application it submitted to the Prosecutor of the International Criminal Court on behalf of the Network of those Abused by Priests, or SNAP. The application requests that the Prosecutor employ his authority under article 15 of the Rome Statute and begin an investigation into sexual abuse of children within the Catholic Church. The charge is that this amounted to a crime against humanity. Dov Jacobs has quite a thoughtful and thorough discussion of the application on his blog. 7. No two judges may be nationals of the same State. A person who, for the purposes of membership in the Court, could be regarded as a national of more than one State shall be deemed to be a national of the State in which that person ordinarily exercises civil and political rights. In a ruling issued today, the Trial Chamber of the Extraordinary Chambers of the Courts of Cambodia has held that the extended form of joint criminal enterprise liability (known as JCE III), by which persons who commit a crime with a common purpose are liable for the foreseeable offences committed by their accomplices, even if the offender himself or herself did not intend these crimes, did not form a part of customary international law and was not contemplated by general principles of law at the time of the Khmer Rouge atrocities. I think there is a clear divergence here with the Appeals Chamber of the International Criminal Tribunal for the former Yugoslavia, which set out the theory of JCE III with reference to post-Second World War jurisprudence. This holding may only be of academic interest, because the main theory of the Prosecutors relies upon a more classic form of complicity known as JCE I. It is only in the alternative that the JCE III theory has been invoked. The Middlesex University law department will deliver a 3-day seminar on “Corporate Liability for Human Rights Violations and International Law” in the offices of Amnesty International in Copenhagen (Denmark) on 28-30 October 2011. For more information on this event and on the pioneering MA Human Rights and Business taught 2 days a month in London (UK) please visit http://www.mdx.ac.uk/humanrights (“Special Events” tab) or contact Dr Nadia Bernaz (+44 (0)20 8411 4957 / n.bernaz@mdx.ac.uk). Richard Dicker of Human Rights Watch writes to announce an online debate concerning peace and justice that The Economist started running this week. Per their Oxbridge debate format, they asked Richard to support the motion 'This house believes that punishing wrongdoers is fundamental to securing lasting peace'. Jack Snyder, the Robert and Renée Belfer Professor of International Relations at Columbia University, is opposing the motion. The debate is being 'moderated' by Bruce Clark. He is one of their correspondents who has written on this topic. The Economist has run several debates for over the last year and they say these 'are often the most popular articles on our site and receive a great deal of reader feedback'. The debate can be found online at www.economist.com/debate. The late Kevin Boyle was honoured on Friday with the award of an honorary doctorate posthumously by the National University of Ireland Galway. Kevin was professor of law at Galway during the 1980s. He launched the Irish Centre for Human Rights at the time. Members of Kevin's family, including his wife Joan, his sons Steven and Mark, and his brother Louis, were present for the ceremony. There will also be a conference at Essex University in November in his honour. 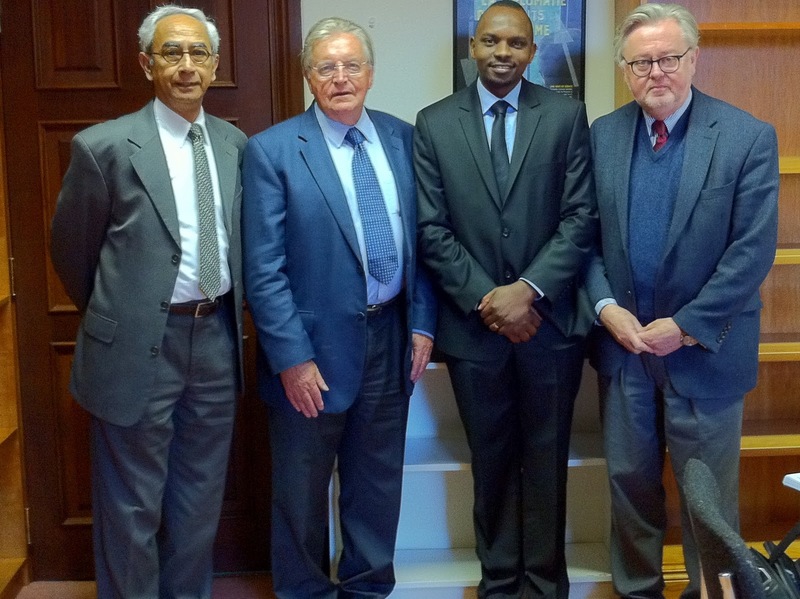 The Universal Periodic Review Process and the Treaty Bodies is the subject of a conference being organized by the Maastricht Centre for Human Rights, to take place on 25 November 2011. Human rights practitioners, scholars and students are all welcome to participate in this one-day seminar concerning human rights monitoring in the Universal Periodic Review and by treaty bodies. The seminar seeks to assess the contributions of the Universal Periodic Review Process in relation to the monitoring of state human rights obligations by treaty bodies. In addition, this seminar aims to evaluate the contribution of the Universal Periodic Review Process in the broader context of the functioning of international peer-based supervisory mechanisms, including the OECD, IMF, Council of Europe, ILO, EU, WTO and the African Peer Review mechanism. Michael O’ Flaherty, Professor of Applied Human Rights and Co-Director of the Human Rights Law Centre, University of Nottingham, and member of the UN Human Rights Committee. Kees Flinterman, Honorary Professor of Human Rights at Maastricht University and the Netherlands Institute of Human Rights (SIM), and member of the UN Human Rights Committee. Andrew Clapham, Professor of Public International Law at the Graduate Institute of International Studies. Marianne Lilliebjerg, Interim Programme Director International Advocacy, Amnesty International. Thomas Conzelmann, Associate Professor for International Relations and EU External Relations at Maastricht University. The report by a UN Commission of Inquiry into the conduct of Israel in its attack on the Flotilla on 31 May 2010 will be issued later today. An advance copy has fallen into my hands. By my reading, Israel comes out rather well from the whole business. Some of its actions are judged 'excessive', but in a more general sense its naval blockade of Gaza is endorsed and the behaviour of those who challenged it is condemned. Today I have taken up a new full-time position as professor of international law in the Department of Law of Middlesex University in London. The lovely house where Penelope and I lived for more than a decade in Oughterard, and that so many colleagues, human rights activists and students have visited over the years, has been sold, alas. We have moved to much smaller premises in north London, although they have the advantage over our village in the west of Ireland of being somewhat closer to Heathrow airport. 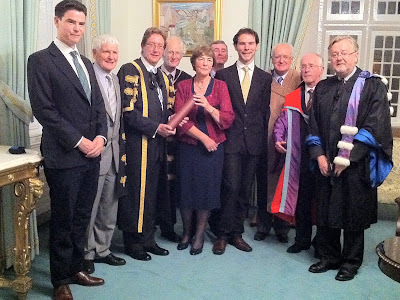 I will continue to be associated with the Irish Centre for Human Rights, as part-time professor of human rights law. At Middlesex, I join a dynamic team of scholars, many of them veterans of the Irish Centre for Human Rights. We offer the full range of university degrees, and are working to build our group of doctoral students who study in the field of human rights.